Catifa conference chair with 4 legged base and amrests. A new, more compact interpretation of the Catifa design that is at ease in any situation: home, office, or contract environment. Stool version also available. The constantly evolving Catifa 46 collection includes numerous models and variants. The shell comes in double-curved plywood, mono and bi-colour polypropylene and can be upholstered in leather, “faux” leather or fabric, or covered in hide or suede. The base comes in chrome finish steel, satin-finish stainless steel or aluminium and is available in a number of options: 4-leg, trestle with or without wheels, sled or five-star. 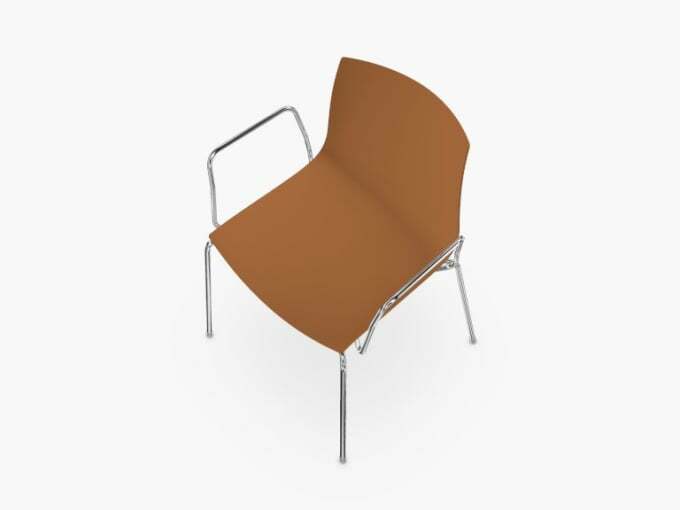 catifa 46 0254 also is available as 0251 without armrests. Do you have a question about "Catifa 46 (0251) with armrests"? How can we contact you?